The Solar System Enhanced E-book* explores what we know about our solar system’s planets, moons, and other celestial bodies. This e-book focuses on asteroids, comets, meteorites, and each of the eight planets in our solar system, including their moons and their rings. Solar system formation theories and technological advances used to study our solar system are also discussed. * Enhanced E-books are highly interactive, self-directed learning experiences designed to augment understanding of science content and pedagogy. These e-books include high-resolution images, animations, videos, interactive simulations, and embedded assessment. 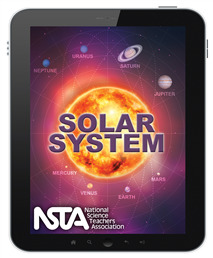 How can you go wrong with NSTA’s new eBook, the Solar System? I found it to be a comprehensive resource that covers four science objectives: “Earth in Space”, “A Look at the Planets, “Asteroids, Comets, and Meteorites” and “Formation of Our Solar System”. I loved the beautiful full screen videos that were provided to further illustrate the lessons along with audio to accompany the text. There were slideshows, animations, interactive visuals, “Hands-on-Activities”, and plenty of interactive simulations that I found to be very useful when I needed to demonstrate a concept. This eBook also included a “Search” button that allowed me to search for information using just a few key words. And the “Check Your Thinking” provided my students the opportunity to answer discussion questions or short answer questions in more depth. Another great feature was the “Review What You Learned”. This feature provided my students, in a multiple-choice format, the opportunity to review the concepts they had just covered. I highly recommend this book to educators and students wanting to explore what we know about our solar system and what is found within it.